The close-in coastline south of Steinhatchee often gets more than its fair share of attention by anglers, especially during the cool early-winter months. There are, of course, a couple of good reasons. First, the bottom is rockier there, providing shelter and warmth for the bait fish and crustaceans that are of interest to inshore species like redfish and spotted sea trout. And second, anglers, like the rats in the story of the Pied Piper of Hamlin, have a tendency to ‘follow the leader’. If everyone else is heading south to fish, that must be where the fish are! It’s taken me several years to recognize that I’d been missing some pretty good inshore fishing by not heading up the northwest-oriented coastline above Steinhatchee. Yes, the fishing’s still good down south and if the winter winds are howling, it’s a dryer trip, but there are some excellent opportunities along the shore on the ‘upper’ side of the river. One noticeable difference between the two sides of the Steinhatchee River is that the southern coastline is oriented south-north and the northern coastline is oriented southeast-northwest. This westward-leaning shoreline, beginning at Bivens Cove, just north of the river, acts as a natural catch-basin for bait and predators. That, along with some big creeks, bays and rocky points adds to the area’s potential for excellent inshore and backwater action as Christmas approaches. There are very few places near Steinhatchee that allow boats to run without fear of hitting bottom. To the south, the biggest obstacle is scattered rocks, but the northern shallows are largely sandy. In any case, it’s never good to hit bottom and leave telltale prop ditches, so I urge boaters to motor north along the edge of the one-fathom(6-foot) curve, which runs northwest from the river channel’s marker #1. My first stop on a northbound fishing trip is the area near Rock Point (N29 41.239 W83 29.206). This area is fairly shallow, but there are fingers of deeper water between the submerged sand bars that allow access at almost any tide. You’ll find the Gulf entrance to these cuts at N29 40.434 W83 28.998, almost a mile south of Rock Point. I recommend you enter this area on a rising tide, fish the potholes to the south and the north of Rock Point for reds and sea trout, and drift out through the cuts as the tide begins to fall. If the water’s cool, you’ll likely find predators hanging out in this deeper water waiting for their prey to wash off the shallow flats on the falling tide. This area can be particularly productive if there’s a northeast wind blowing water away from shore, producing a lower-than-low tide. Another choice fishing area, although farther north, is along the shoreline near Fishermans Rest (N29 43.399 W83 32.077). A stubby point of high ground north of Dallus Creek, the place gets its name because it was once a good spot for commercial mullet fishermen to dry their nets. Now, you’ll rarely see more than just a few flats skiffs poling the shore and the mouths of the creeks that flank Fishermans Rest. The best action here seems to be when the tide floods over sun-warmed rocky points and bars, usually in late afternoons, attracting bait and predators like Steinhatchee’s famous ‘gator trout’. To reach Fishermans Rest, ease your way northeast from a point at N29 41.580 W83 32.709, which is about 2 miles south of the shore. You’ll be following an old creek channel that’s easy to see when the water’s clear. It ends about a half mile south of Fishermans Rest at N29 42.771 W83 31.656. The rest of the trip is up to you, and I urge idle speed or slower! 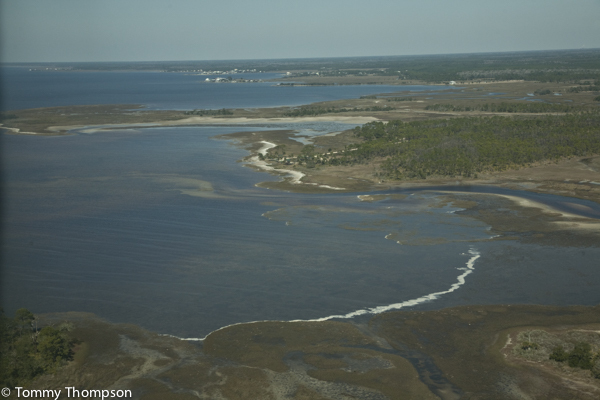 Hagens Cove has been a favorite destination for inshore anglers for many years. 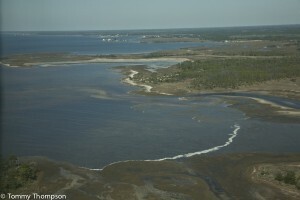 Located between Piney Point (to the south) and Sponge Point (to the north), the cove is fed by Oyster Creek. Located almost exactly 10 miles from the mouth of the Steinhatchee River, this hot spot can be difficult to reach if the wind’s blowing and the seas are rough. A safe course, if you wish to take it, is to follow the one-fathom curve to a point just west of Hagens Cove at N29 46.398 W83 38.347 and run directly towards the middle of the cove. The bottom here is largely clear of rocks, but care should still be taken to not damage the sea grass cover. Some of the best fishing here is done by anglers drifting from Sponge Point to Piney Point (or vice-versa) when the water temperatures are still in the high 50s. Hagens Cove can also be accessed by car from Highway 361, making it popular for wade fishermen and paddle craft anglers. Cold and cool-water fishing involve different bait presentations than in warmer weather. No matter if you’re tossing baits under popping corks, jigs with soft plastic tails, or plugs, you must slow down your retrieves. Slow sinking lures work especially well, and I’ve had lots of success over the years using lightly pinch-weighted D.O.A. jerk baits, rigged weedless with a 4/0 hook. Cool water slows the metabolism of predator species like sea trout and redfish and they’re not really interested in chasing down their dinner. Additionally, learn to make long accurate casts, something that’s aided by using braided line and moderately light spinning tackle. And finally, be very careful regarding noise. Slamming hatches and cooler lids, loud yelling and jumping from deck-to-floor are all fish-spooking behaviors. Stealth will always pay off in cool clear waters.